Who’s the next Atlantic 10 player to get drafted? The 2017 NBA Draft came and went without an Atlantic 10 Basketball player hearing his name called. Despite this, a number of talented graduates are now earning summer league spots with NBA teams, in hopes of making a roster next season. Check out a full list of Atlantic 10 players that have earned spots thus far. DeAndre’ Bembry of the Saint Joseph’s Hawks was the last Atlantic 10 player to go in the NBA Draft. The junior left the Hawks after the 2015-16 season to pursue a career in the big leagues, and sure enough, the Atlanta Hawks took him 21st overall. With talented Atlantic 10 players returning in 2017-18, we have to ask ourselves if we’ll see a player get taken in next year’s NBA Draft. Here are some talented possibilities. Everyone in Olean is excited about next season, and Jaylen Adams is giving them justifiable reasoning. The kid can flat out play. Averaging 20.6 points and 6.5 assists as a junior, Jaylen Adams is already popping up on NBA scouts’ radars. He’s got the ability to take over games and score upwards of 25 points on any given night. Most importantly, he notched up his defensive intensity last season, averaging 2.1 steals per game. 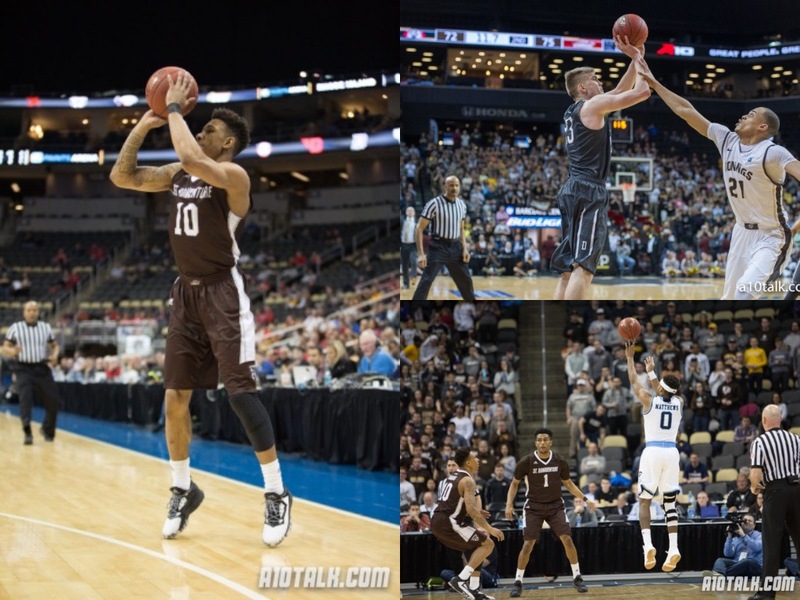 Adams has been maturing and is set to have his best season yet at St. Bonaventure. He declared for the NBA Draft this past season but opted to return to school instead of staying in the draft. Jaylen Adams’ draft stock is going to depend on what he’s capable of doing his senior season. DeAndre’ Bembry really helped his NBA chances when he led his team to a first round win in the NCAA Tournament and when he put up a serious fight against the top-ranked Oregon Ducks. Adams is going to have to get the Bonnies dancing this season. Peyton Aldridge is going to get some serious NBA consideration after the 2017-18 season is complete. Are NBA scouts talking about him right now? Maybe not. Will they be at the end of the season? You can bet on it. Without Jack Gibbs, Aldridge is going to have the green light to pretty much take over this Wildcat team. Aldridge has shown the ability to score inside and out, rebound, and play stellar defense. He hustles, he’s scrappy, and he’s got great size for an NBA prospect. What’s the next step? Get his name out there for the world to see. Aldridge is really going to have to take the league in his own hands and dominate the A-10 if he wants a shot in the NBA Draft. While his numbers look great already, and he’s an excellent shooter from all over the floor, the senior is going to have to remain consistent. If he’s taking every shot for Davidson next year, and he’s only cashing in on 35% of his attempts, NBA teams might look elsewhere. It’s going to be tough, but if Aldridge really explodes next season and puts the Wildcats on the map, he might be the next great Davidson alum in the NBA. I wouldn’t be surprised to see E.C. Matthews taken in next year’s NBA Draft. Like Jaylen Adams, he’ll have a chance to take over the league and really display himself as one of the best guards in the nation. One thing that Matthews already has going for him is NCAA Tournament experience. Talk about a guy who’s played in some big games, the junior helped the Rams win the A-10 Tournament and almost took down the Oregon Ducks to reach the Sweet 16. He’s only going to get more attention on the national stage this year, given that Rhode Island makes it back to the Big Dance. With this year’s roster, that seems like a very feasible goal for this team. E.C. Matthews has been an NBA prospect for quite some time, and I’m sure he’s going to get quite a lot of attention when he takes the floor next season. Matthews is going to need to continue to show his ability against tougher opponents as the 2017-18 season marches on. Putting up 20 points per game against La Salle and Duquesne just isn’t going to cut it for the senior. It’s going to come down to showing up against the powerhouses in the Atlantic 10 and playing big time basketball when the NCAA Tournament rolls around. I wouldn’t rule out Matt Mobley of SBU either! He has the build of a NBA player already, definitely the athleticism, and the ability to take over games with his scoring (especially in big games). The Bonnie’s hold what could be the best backcourt in the whole Nation, which isn’t far fetched considering last yr they finished in the top-5, and if Adams has another great yr, Mobley just has to replicate his numbers from last season and like Adams get to the Dance!